They were very good workers and easy to work with. They pleased us very much, and they worked with us. They were very patient while we made up our mind. Their service, they have been around for a long time, and they know what they are doing. They got the job done, and they did what they said they were going to do. Rafael Floors, Abbey Carpet Center offers a variety of floor coverings to residential clients in Marin County and San Francisco, including laminate, hardwood and vinyl floors; natural flooring (wool, cork, seagrass, bamboo); and carpet. 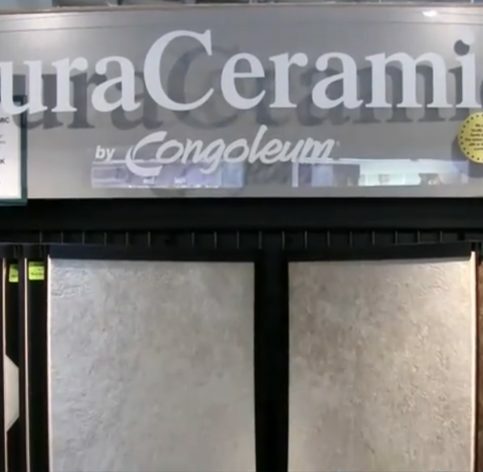 The company’s 5,000-square-foot San Rafael showroom allows customers to view its products in a full range of styles and colors. 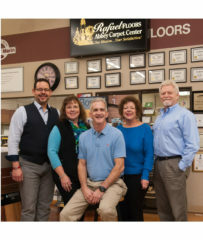 Since opening its doors in 1957, Rafael Floors has been inducted into the Best of Marin Hall of Fame and has earned several local awards, including Pacific Sun’s “Best of Marin – Carpet Store” 13 times and “Best of Marin – Hardwood Flooring” seven times. Owners Ron Leach and Steve Villa have a long history with the company—Mr. Leach started in 1962 and Mr. Villa joined in 1978. Rafael Floors’ employees hold designations such as CFS (Certified Flooring Specialists) and CFI (Certified Flooring Installers), and they train continuously to keep updated on the latest industry trends and product and installation techniques. 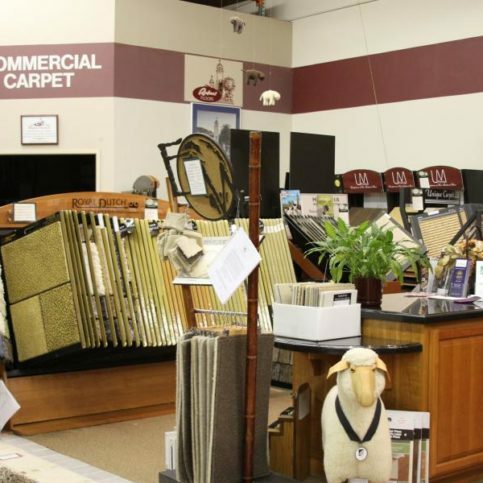 Rafael Floors, Abbey Carpet Center’s staff members are continuously trained to stay up-to-date with the flooring industry. 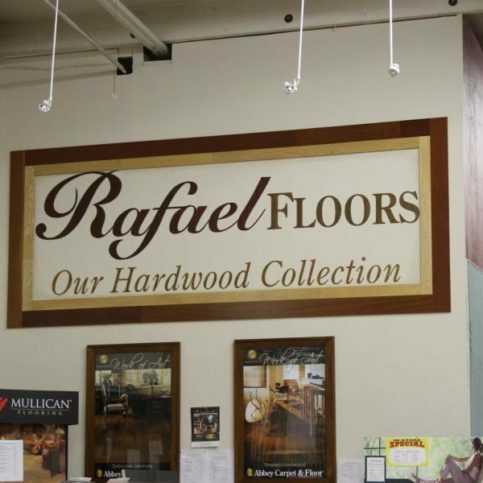 Since opening its doors in 1957, Rafael Floors has been inducted into the Best of Marin Hall of Fame and has earned several local awards, including Pacific Sun’s “Best of Marin – Carpet Store” 13 times and “Best of Marin – Hardwood Flooring” seven times. Owners Ron Leach and Steve Villa have a long history with the company–Mr. Leach started in 1962 and Mr. Villa joined in 1978. When you decide to install a new floor in your home, it’s important to choose the right type. Different styles have different strengths and weaknesses, so it’s best to understand them before you commit to an installation. 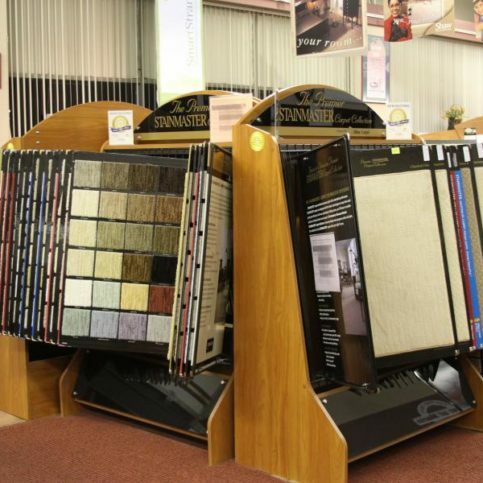 Today’s carpeting offers increased performance, style and design compared to years past. New fibers such as sisal, seagrass and wool are becoming more popular. With so many fibers available in a range of colors and styles, carpeting can fit any budget and enhance any home’s décor. Prefinished hardwood floors have a more durable and easy-to-maintain finish. Many prefinished hardwood floors have an ultraviolet-cured polyurethane finish, and many have added aluminum oxide particles for exceptional durability. Whether you choose solid, engineered or long-strip, hardwood floors can be touched up or refinished in case of accident or wear. With the look of real hardwood, ceramic or stone tiles, laminate flooring offers style, texture and durability. Laminates carry warranties against staining, sun fading and finish layer wear. They don’t need to be polished, refinished or waxed, making them ideal for active households. Vinyl floors offer the broadest range of color, style and performance options. The quality of a vinyl floor generally corresponds to the price—the higher the cost, the more sophisticated its style and the better its performance and warranties. The availability of 12-foot-wide rolls provides seamless installation for larger rooms. Vinyl is the best option for areas exposed to spills, water and moisture, such as kitchens and bathrooms. Q: After I select a floor, how soon will the installation be complete? A: It usually takes seven to 10 days from when we receive the product to when it’s installed in your home. A: The only time there’s a problem with living in the house is when we’re applying finish to a hardwood floor. You can’t walk across the floor while the finish is wet, so depending on what areas of the house are being worked on, it may or may not be practical for you to stay. Q: Are the chemicals and finishes you use safe for people and pets? A: Absolutely. The only chemicals and finishes we use are for hardwood floors. All our materials are EPA-certified and have to pass additional Bay Area standards for volatile organic compounds. Q: I’m sensitive to new carpet smells. Is there anything that can be done about it? A: Yes. Some carpets give off synthetic oil by-products. They’re nontoxic, but some people are sensitive to them. If that’s the case, we can unroll the carpet in our warehouse and let it air out for 24 hours. 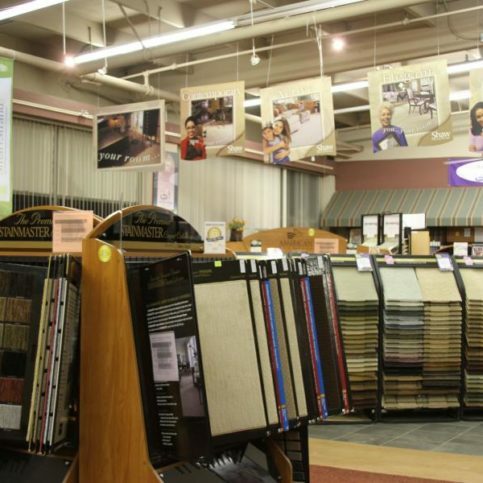 Rafael Floors’ San Rafael showroom features a wide variety of carpet products. 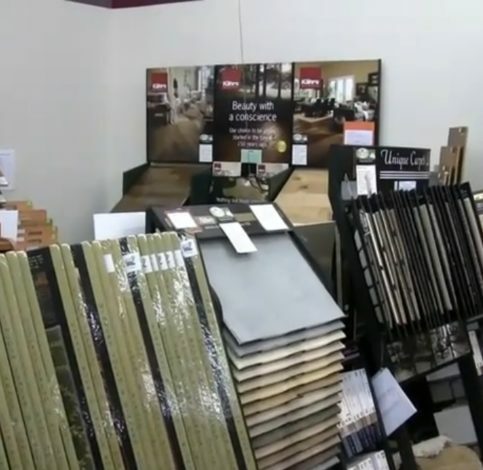 Rafael Floors offers numerous hardwood floor products at its San Rafael showroom. Steve Villa is president of Rafael Floors, Abbey Carpet Center, a Diamond Certified company. He can be reached at (415) 669-4944 or by email. A: Actually, I’d like to see more of the United States…maybe get an RV and do the Route 66 thing. A: I like them all, but I’d probably choose spring because of the new growth and nice weather. A: If I’m not working, I enjoy watching sports. A: It’s a tie between the San Francisco 49ers and the Green Bay Packers. I grew up rooting for the Packers. A: Cars. I have a small collection that includes a 1966 Corvette Stingray convertible, a 1974 Chevy pickup and a 1991 Camaro convertible. 2. An unfinished wood floor affords a virtually unlimited range of custom color and stain options. 3. An unfinished wood floor is totally customizable, which makes it easy to incorporate borders, insets, medallions and other fine touches. 1. Since there’s no sanding or staining required, installing a prefinished wood floor is easier, quicker and cleaner (not to mention less expensive) than installing an unfinished one. 2. A prefinished floor’s factory finish is more durable than the finish applied to an unfinished floor. 3. 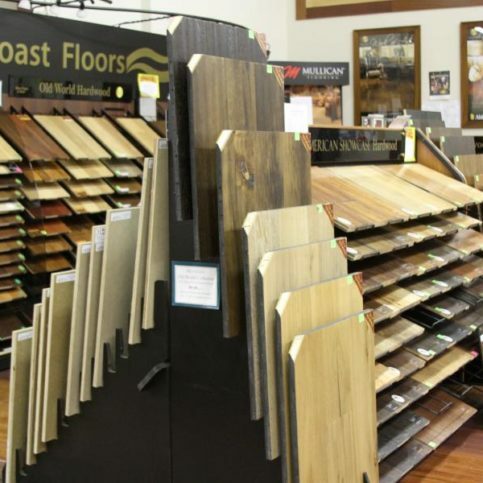 While not customizable, prefinished flooring comes in a wide variety of colors and styles. When it comes to faux wood flooring, there are two primary options to choose from: laminate and luxury vinyl plank. Laminate is composed of a melamine wear surface, a fiberboard core and a melamine backing. These layers are fused together under extreme heat and pressure to produce a product that’s harder and more durable than authentic hardwood. So, if you’re looking for a faux wood floor with superior dent and scratch resistance, laminate is an excellent choice. The other option to consider is luxury vinyl plank. Not to be confused with luxury vinyl tile, this product is also known as floating vinyl plank because it doesn’t attach to the subfloor—it simply clicks together and “floats” freely above it. Luxury vinyl plank is similar to laminate in a lot of ways. The main difference is its core, which is made of extruded plastic instead of wood. This offers the benefit of a floor that looks like wood but is totally waterproof. So, if you’re concerned about spills or installing in a bathroom or laundry room, luxury vinyl plank can be a great option. Diamond Certified Expert Contributor, Steve Villa: Wood-like floors are very popular these days. And so, today I want to discuss the various options, of which there are several. And the first and probably the most obvious option is real hardwood floors. With real hardwood there are 2 options. One would be an unfinished wood floor, which we would install, sand, and finish in your house. And the other option would be a prefinished or factory-finished wood floor. The advantage to a sanded floor, an installed sanded finished floor, is we would be able to give you the smoothest floor available. We would be able to sand out imperfections in both the flooring material and also in the subfloor. In addition to that, with a sanded floor we have the option to fine-tune our stains and create an almost unlimited color palette. And the third benefit to an unfinished or sanded floor is that if you wanted to incorporate borders, or insets, or medallions, a sanded floor lends itself to that type of custom work. With a prefinished floor, basically, what you see is what you get. But there are some benefits to it. There are many choices and styles in prefinished. You can see some of those here behind me. The main advantage to a prefinished or factory-finished floor is: It does not require sanding. So, as a consequence, you cut down on the mess associated with a sanded floor. It’s a quicker, cleaner installation. The other benefit to a prefinished floor is that the factory finish is more durable than the applied finish that we use with a sanded floor. So, quicker and cleaner finish, and slightly more durable finish. The second category of floor that I want to discuss today is a laminate floor. Now, a laminate floor is a very durable imitation wood floor. It consists of a melamine wear surface and a melamine backing fused onto a fiberboard core. And under heat and pressure those layers are all fused together. That’s the lamination process. And what you end up with is a floor that is harder and more durable than real hardwood. So, in terms of dent resistance and scratch resistance, a laminate floor might be a good choice. If you have an active lifestyle, if you’re raising kids, if you have pets, a laminate floor’s durability might be a good choice for you to consider. And the third category of flooring and probably the newest is the floating vinyl plank. It’s also known as luxury vinyl plank. By “floating,” I mean that it clicks together. It is not attached to the subfloor. And it’s similar to a laminate floor. What’s different about it is instead of having a wood core, it’s actually extruded plastic. So, the benefit to that because it’s a plastic product that looks like wood is that it is waterproof. So, if you have concerns about spills or if you’re going to use it in an area like a laundry room, like a bathroom, this might be a good choice for that application. Rafael Floors, Abbey Carpet Center : Average 9.5 out of 10 based on 450 unique customer surveys of customer satisfaction. Very knowledgeable and they offer good prices. They solved a real big problem for me. Super helpful and knew the product and were great in the customer service department. I like their location and the people, everything was great. The people were all knowledgeable, friendly and had high level skills. Easy to work with, I don't have to worry about the job being done correctly, it always gets done right and in a timely manner. Knowledgeable staff, good service and they offer good advice. I guess it was an easy process. When I call generally, I get to talk to someone who is very knowledgeable and usually familiar with my buildings. Consider the company when looking for carpets. They fully explained everything that they were going to do before they did it. You can't go wrong, they are reliable, honest and provide great work. They delivered what they said they would and they did it in the time frame they gave me. They did the job and they were very professional. One fellow was very experienced and he worked great with the other guy as a team. They got the installation done in one day just as they said they would and did a great job. They know their stuff and they have been doing it for a while. They were really helpful and are knowledgeable of what they offer. They offer a wide range of help. They are knowledgeable and their open hours are great. I think the price was fair and good. They show up on time and get the job done quickly. They were prompt and rather efficient and we were overall happy. They did good work and we were happy. They are very conscientious and they did very good work. Whenever I needed something done, it got done very professionally.